As I write, it’s December – not exactly peak gardening season, and yet now is the time when many are planning their gardens for next year, and in particular, some will be drawing up their flower border plans. In creating a flower border for bees and pollinators, it's not only important to provide nectar and pollen through the seasons, you should ideally include a variety of different flower and petal shapes and types. In this way, your pollinator flower border can provide for the differing needs of bees with long or short tongues, different flower preferences and so on. It's worth doing a little planning first! 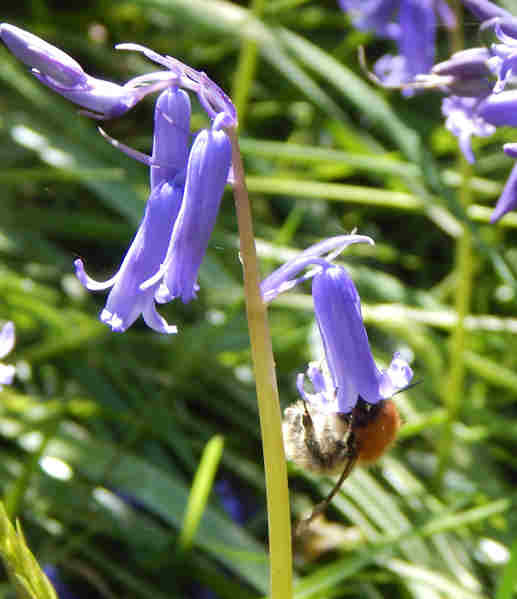 Inded, a lot of people are keen to help wildlife in their gardens, and that includes bees, butterflies and other pollinators. Whatever you want to call it, it's worth spending a little time to plan it out - even roughly - if you can. There are some who believe that wildlife gardening literally means allowing the garden to become wild and unmanaged. However, when you are gardening for bees (and other wildlife) you can include formal or informal flower border designs, filled with wild flowers or garden flowering plants and shrubs (or both), and even fruit and vegetable plants! There are no rules – simply the availability of nectar and pollen rich plants for bees and other pollinators is what is important. Go organic, or at least pesticide free and keep the use of even organic chemicals to a minimum. The photograph below pictures a flower border in an organic garden, where no chemicals are used! If large borders like this can be managed without chemicals, so can smaller borders and gardens. 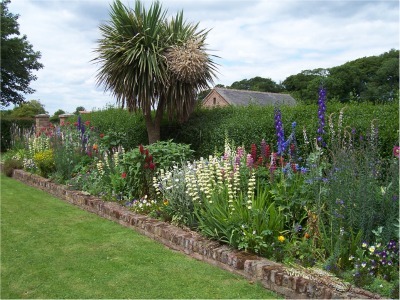 I am told this border takes minimal upkeep, and anyway, the owners are too busy with chickens, goats and growing vegetables to be bothered too much with their flower borders! Although this page is about flower borders, try to create nesting sites by adding a solitary bee house (such as hollow canes) or better still, remember hedgerows can provide excellent opportunities. 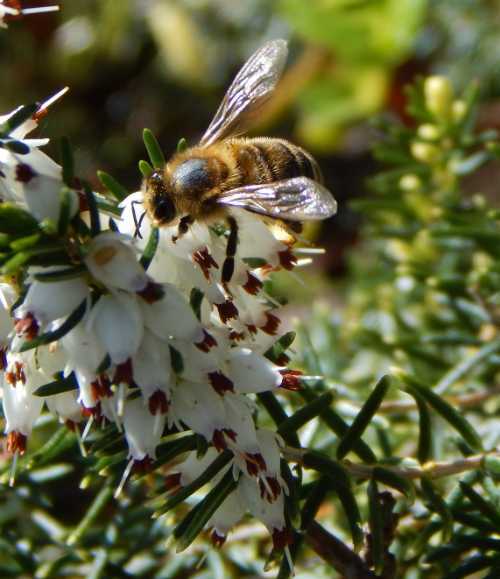 This website has a whole section on Plants For Bees – including herbs for bees, wildflowers, shrubs, hedgerows, trees, fruit and vegetables, and even plants for problem places, and lawns for pollinators. On this page, we’ll take a look at a few pointers to remember when choosing different flower shapes, without going into detailed lists about specific plant species. 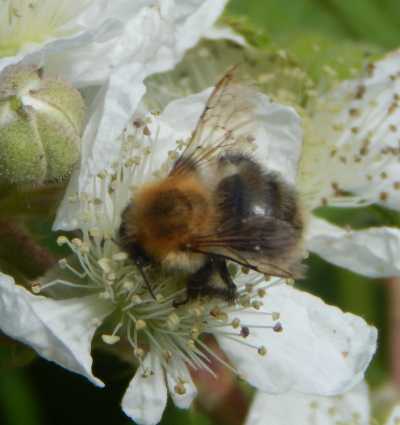 Brambles are a real favourite - honey bees, bumble bees (above, and various solitary bees feed from the flowers. 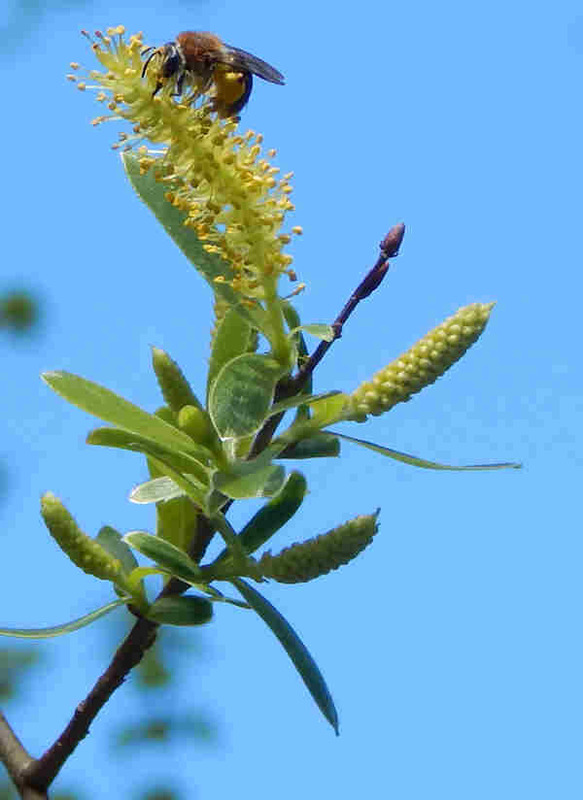 3. brush type blossoms, for example, willow catkins and ivy. Willow catkins provide valuable food in early spring. Many beneficial varieties are available, including compact trees for small gardens. 6. tube type blossoms – such as verbena, buddleia, heathers (some blossoms are a combination of bell and tube shape – such as viper’s bugloss). 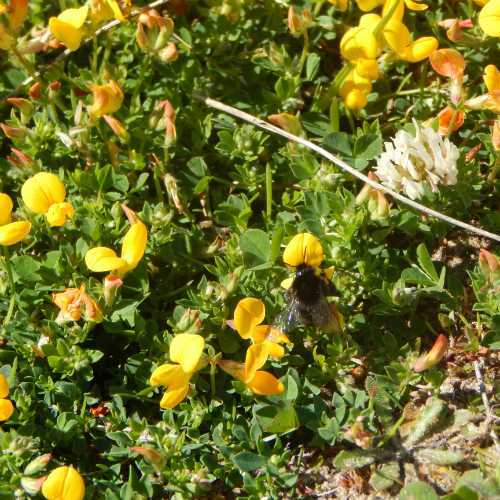 Plant in swathes – this means the gathering of nectar and pollen by the bees and other pollinators, can be undertaken more efficiently, with less energy used in flying between flowers to find more nectar and pollen sources. 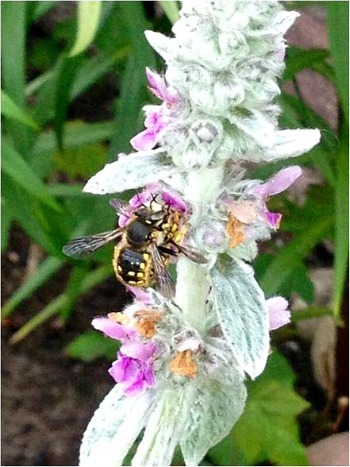 Planting in swathes is also believed to create stronger visual cues for pollinators. 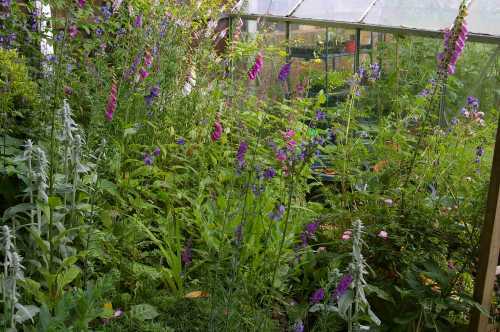 If in doubt, remember you can rarely go wrong with wild flowers, herbs and cottage garden plants. Ensure a range of plants are in bloom throughout the seasons. 1. Purchase from an organic supplier – or at least, try to buy pesticide free bulbs and seeds to minimise the risk of contamination with harmful pesticides and herbicides, and buy traditional rather than highly cultivated stock. Check out my tips for getting Free Plants For Bees if you are on a budget. There are plenty of ideas for sharing, dividing, and finding seeds. 2. If your flower border is only small, remember you can create pollinator feeding stations in hanging baskets, tubs, and window boxes too! You can even allow hanging baskets to hang from tree branches – simply fill the baskets with plants that are tolerant of dappled shade, and remember to water the hanging basket as necessary. However, don't be discouraged by a small garden. This is a picture of a small patch of garden behind our greenhouse. It's full of many plants loved by bees, from campanula and lamb's ear to dandelions and toadflax. You can read more about gardening for bees in small spaces here. 3. 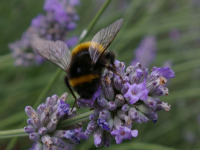 Take a look at these resources: Bee Garden Basics, Flower Bulbs For Bees, Bee Plants. 4. Finally, creating flower borders for bees is a great way to help our pollinators. But what else can you do? Here are 10 quick tips to help save the bees.